The smallest chick that was rescued from the parapet on Friday morning June 3 took off later that day and was not spotted for several days. Thank you to all who helped to look for him. He surfaced on Monday June 6 on the 5/3 building and has been seen flying well since then. He flew up to the 15th floor, which is close to the rooftop. Mother Rebecca knew where he was the whole time and was feeding him. Tonight he dropped in for dinner with Mom and his big sisters near the nest box then flew off again after eating. The two female chicks look as big as their mother and have not yet taken flight. They love to eat and cry for food every time Rebecca flies by. They have been content to bask in the sun and now jump to the top of the nest box. They will occasionally flap their wings, but have not put a lot of effort into developing their flying muscles. The male who jumped early and luckily landed safely on the parking deck roof is doing fine in rehab. He is flying some and his flying skills and strength are being assessed. He will come back in several days if he continues to make improvements. If his flying does not progress, he may get some radiographs to insure that there are no injuries that need special attention. Since the birds are not in the nest box very much, we will discontinue the live stream function. 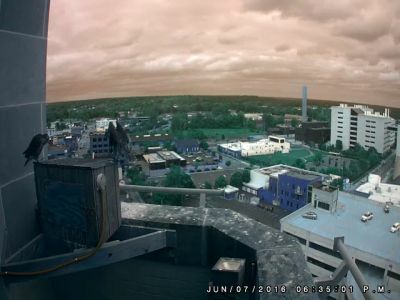 The real time viewing with 5 second refresh will continue for the nest box and parapet cams (and will work better without the live stream taking so much band width).